Confortable and private tree top house in a natural setting, where you can forget all about stress watching birds, monkeys, squirrels, iguanas etc.and only a hundred meters from the beach. 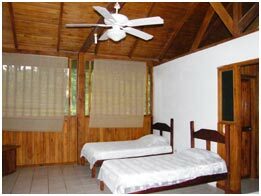 The property is 20.000 meters, count with 10 bungalows made in wood and netting, surrounded by native trees and tropical garden. The bungalows located high up the slop have ocean view. The bungalows are one bedroom with 2 or 3 beds (double and singles) for 2 or 4 people maximum. Each one has a balcony with 2 hammocks, bathroom with hot water, ceiling fan and a large safe box. The restaurant is located in the administrative area. There is a swimming pool and a parking lot near the bungalows. Enjoy with your family or friends in the comfort of our bungalows, get out of routine and relax your mind to the sound of nature.